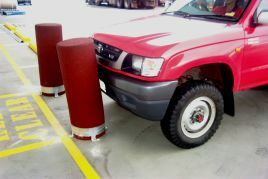 Bendas are flexible rubber bollards with a steel reinforced base and internal chain. Designed to be used for traffic calming in areas with a continuous high risk of minor collision. Bendas have the ability to bend to almost 30 degrees and then rebound completely to the upright position. Bendas are available in 3 colours – Black, Red and Green (custom colours available upon request). The product is made from solid recycled rubber. Its uniquely engineered design can withstand side-loading pressure from all four directions. Bendas are extremely flexible and a hard wearing product. The base can be bolted onto any concrete surface with masonry anchors. Recommended diameter of masonry anchor is 16mm Ø x 100 mm long.